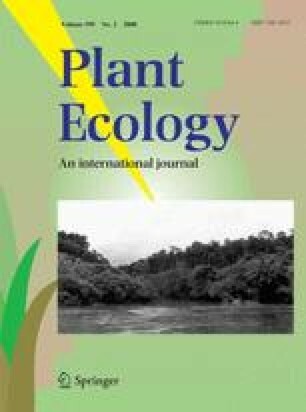 We summarize a long-term study of the effects of edge creation on establishment of the economically important arboreal palm Oenocarpus bacaba in an experimentally fragmented landscape in central Amazonia. Recruitment and mortality of large individuals (≥10 cm diameter-at-breast-height) were recorded within 21 1-ha plots in fragmented and intact forests for periods of up to 22 years. In addition, 12 small (0.7 × 14 m) sub-plots within each 1-ha plot were used to enumerate the abundance of seedlings and saplings (5–400 cm tall). On average, the recruitment of large trees was over two times faster near forest edges, leading to a sharp (90%) increase in the mean population density of large individuals near forest edges, whereas the density of larger trees remained constant in the forest interior. Overall seedling and sapling density was significantly lower in edge than interior plots, but edge plots had a much higher proportion of larger (>100 cm tall) saplings. Our findings demonstrate that forest edges can have complex effects on tree demography and that one must consider all tree life stages in order to effectively assess their effects on plant populations. The manuscript was greatly improved by reviews from B. Nomann, M. Sandrini, M. Da Costa, J. Narita, and an anonymous referee. E. Hooper allowed us to collect data in her study sub-plots. Support was provided by the NASA/LBA Program; Programa Piloto para Proteção das Florestas Tropicais (PPG-7); A. W. Mellon Foundation; Conservation, Food, and Health Foundation; World Wildlife Fund-U.S.; MacArthur Foundation; National Institute for Amazonian Research (INPA); Fundação de Amaparo à Pesquisa do Amazonas (FAPEAM); Conselho Nacional de Desenvolvimento Científico e Tecnológico (CNPq); and Smithsonian Institution (SI). This is the publication number 509 in the BDFFP Technical Series.